BEIJING, March 12 (Xinhua) -- Senior leaders on Tuesday joined lawmakers in different panel deliberations at the second session of the 13th National People's Congress (NPC). The leaders -- Li Zhanshu, Wang Huning, Zhao Leji and Han Zheng -- are members of the Standing Committee of the Political Bureau of the Communist Party of China (CPC) Central Committee. Joining the deliberation by deputies from Ningxia Hui Autonomous Region, Li, chairman of the NPC Standing Committee, stressed the adherence to the Party's centralized and unified leadership over advancing law-based governance in all fields, and called for sound legislation, strict law enforcement, impartial administration of justice and the observation of law by everyone. Wang Huning, a member of the Secretariat of the CPC Central Committee, joined the deliberation of the delegation of Shanxi Province. He called for the implementation of a new vision for development, as well as further efforts to push forward reform and opening-up from the new staring point, and to take new steps in promoting high-quality development. Joining the delegation of Liaoning Province, Zhao Leji, secretary of the CPC Central Commission for Discipline Inspection, urged the implementation of various tasks including transforming the growth model, optimizing economic structure and shifting growth drivers to nurture emerging industries, new business models and fresh growth momentum. 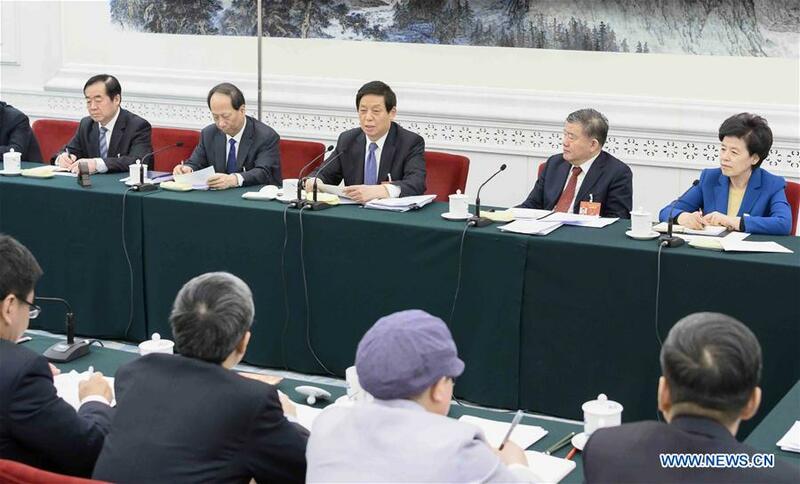 Vice Premier Han Zheng called for vigorous implementation of the strategy of innovation-driven development, concentration on major scientific and technological problems, and new breakthroughs in areas of strength, when joining the deliberation of the Anhui delegation.